London is heady, exciting, romantic – rich with tradition and with dissent, forever renewing and re-positioning itself, part real, part myth. Above all, London has inspired some truly great poems. Introduced by George Szirtes, this pamphlet pays homage to the great metropolis and explores its public and private spaces. Royal weddings come and go, Olympians fly in and fly out, but London keeps on transforming itself, feeding the imagination of writers and defying definition. 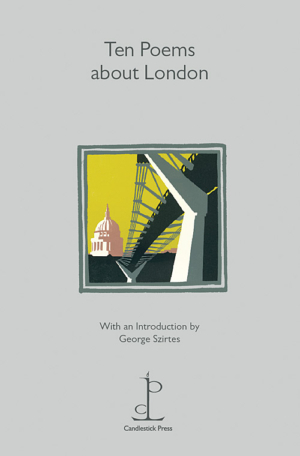 This pamphlet is good news for anyone who is curious to read poems London has inspired – and also for visitors to, residents and fans of London who want something other than a toy London taxi to remember it by and send to friends. The selection in this pamphlet ranges between William Wordsworth’s sonnet of 1802, ‘Composed upon Westminster Bridge’ , to ‘Trojan Horse’, a new poem by George Szirtes specifically commissioned for Ten Poems about London and published here for the first time. The poems tune in to the sounds, sights, history of London – they roam its pavements, sit out under its street lamps in the dark almost-silence of the city asleep.